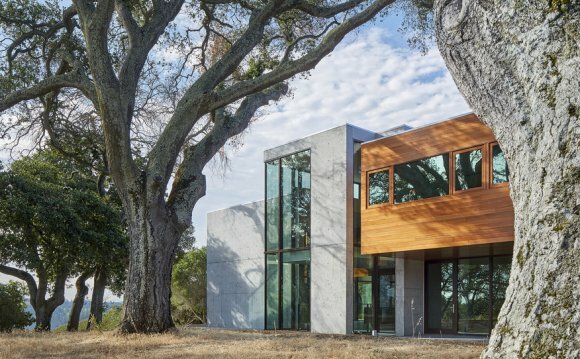 Situated along a dense grove of live oak trees and located less than a half mile from the San Andreas Fault, the project is conceived to amplify the natural and experiential forces at work on the site and beyond. Organized as a portal that frames views to San Francisco Bay, Stanford University, and the Santa Cruz Mountains, a concrete armature wraps and cradles wooden cartridges inserted within. Spatial fissures between the visceral concrete structure and refined wood volumes allude to the tension between the earth’s surface and tectonic plates that lie beneath. Built to withstand extreme seismic events, the project explores juxtapositions of the heavy and light, public and private, and the refined and raw, while revealing the hand of the artisan and the forces of nature. The projects design pedagogy is further coupled to the sustainability practices employed. The concrete structure not only protects the home from wildfires and provides solar shading to living areas, but acts as a thermal mass heating system. Fresh air marine layers from San Francisco Bay are utilized to cool the home via motorized windows and foundation louvers as well as whole house fan systems that create thermal chimneys through the spatial fissures. Warm air is exhausted at the stair tower and hot yoga room located at the buildings apex. Localized air conditioning is only provided at the private bedroom cartridges and rarely utilized. A 20KW solar array feeds recycled electric car batteries that power the house. LED lighting fixtures and variable speed Energy Star equipment is utilized throughout to minimize power loads.